On the Rocks Villa is impressive to say the least. The master bedroom is positioned so that you can lie in bed and watch the sun come up in the morning. Once you’re awake, you can take a quick walk to the beach and search for shells or sea glass to take home for souvenirs or stretch out on the beach to catch some early morning rays. The shoreline is so beautiful, it may inspire your inner artist. If you just want to relax, crawl into the hammock and take a nap. Finish your days with music on the terrace, open a bottle of Champagne, and relax while the sun disappears over the horizon. 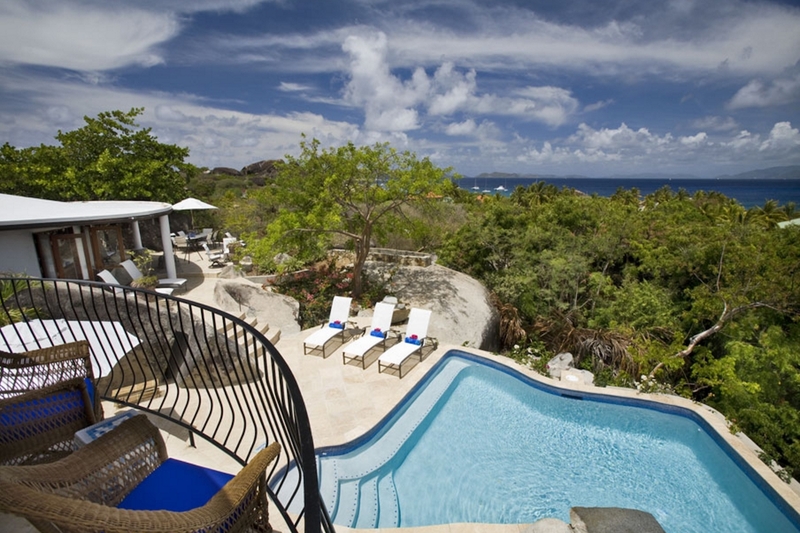 On The Rocks Villa is less than two minutes away from Virgin Gorda’s white sand beaches. Lush gardens filled with bougainvillea, orchids, tropical trees, and boulders combine the villa’s three pavilions into one property. Stone stairs that blend with the landscape create the entrance to On the Rocks. There’s several places outside to relax and take in the view, and the large wading pool has a soothing rock waterfall. Up a small set of stairs, guests can find outdoor dining, a BBQ grill, and a hammock. The main pavilion incorporates the living and dining areas, as well as an open-plan gourmet kitchen. The kitchen features granite counters, a solid granite sink, a Wolf gas range, wet bar, and modern appliances such as an espresso/cappuccino maker. This pavilion features the Rising Sun Suite, which has a four-poster king-sized bed and French doors that open out to the private garden patio. Its ensuite bathroom has a dual vanity and an al fresco shower area. The adjacent two-story pavilion features two identical king suites, one on each level. Walk right out to the pool from Sea Breeze Suite’s French Doors. The High Tide Suite above has sea views from the balcony, and both suites feature outdoor showers. The third and final pavilion houses the Tradewinds Suite, which is furnished with two twin beds that can be converted into a king, and an ensuite bath with a garden shower. French doors open to a private patio, which has a hammock and seating for two. On the Rocks Villa is located in Little Trunk Bay, just a couple of minutes’ drive from Spanish Town and The Baths. This villa’s location is ideal for lazy days sunbathing by the pool, snorkeling and floating in the ocean off Little Trunk Bay beach, or watching the sunset and stargazing. On The Rocks is near Sol y Sombra, and both villas can be rented together to accommodate up to 18 guests. Walk 100 yards along a paved road to the beautiful white sands of Little Trunk Bay and to Valley Trunk Beach beyond, or drive 1/2 mile to The Baths. It's only a 3 minute walk to Little Trunk Bay Beach! The villa greeter will meet guests at point of entry on the island. Guests follow greeter in their rental car or a taxi to the villa. Arriving On The Rocks guests will receive complimentary arrival snacks and tropical fruit punch. Guests will also receive a welcome folder with recommendations for activities, restaurants & excursions.